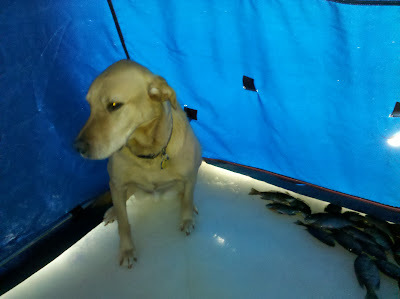 My lab Berkley and I made a trip to one of my favorite bluegill lakes for some ice fishing this morning. I arrived at daybreak and was greeted by a swarm of pike fisherman in my spot. I relocated around the other side of a point to get away from the crowd. Fishing started off slow, but picked up by mid morning, with a solid limit of 8's and 9's. Berk spent most of the morning sleeping in the shanty next to me, however, he did make time for a quick photo. My highlight of the morning was landing this pig of a bluegill. At 9.75 inches, it was damn big. For those who don't bluegill fish, you'll just have to take my word for it! According to the weatherman, we should expect a serious warm-up later this week. These mid-winter thaws are prime time for streamer fishing for brown trout and for fresh pushes of steelhead. I'll be on the river! Thanks Blake, I'm adding a ruler to my tackle bag! My brother and I are racing for a 10" Gill..so close! Great work on the gills and the jumbo is a nice bonus to brag about. I like your three-S tag line with the new logo too! Love the new look....but I love that pig gill even more!!!! Thanks Pete! 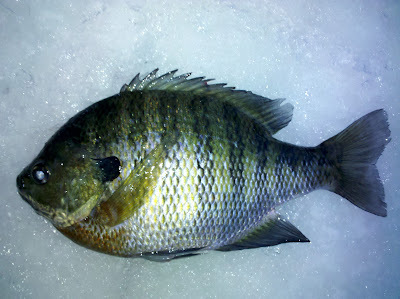 That's my best gill of the season, with first ice conditions long gone, it may be hard to beat!